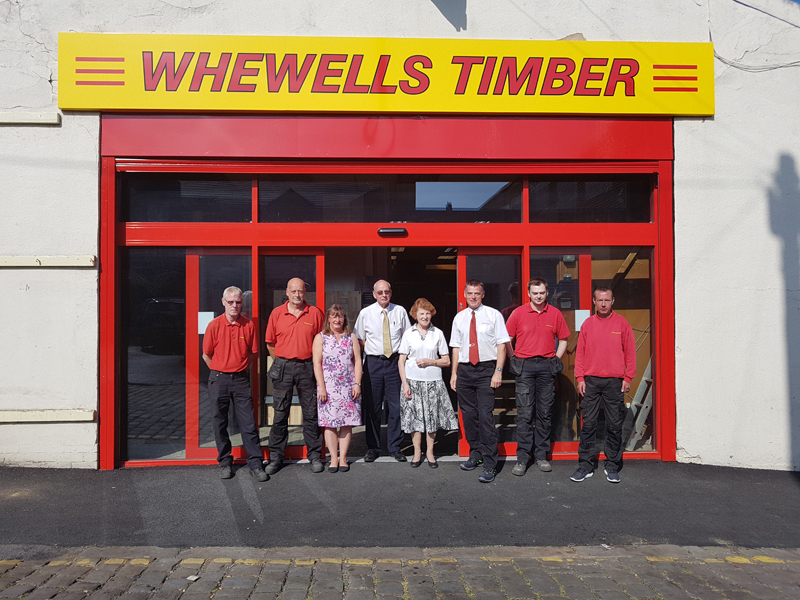 This year sees the 60th anniversary of Whewell’s Timber in Accrington as a Limited Company. The story doesn’t start there though as Gordon Whewell reminded me. His parents, Rowland and Olive were the prime movers. “The story of the family business started in 1947, two years after the war, when my father bought a run-down hardware shop in Warner Street. He still worked part time at Lang Bridges and my mother worked at Woolworths as a window dresser. The shop in question was number 45 Warner Street, on the corner of Cross Street and although Rowland and Olive called it The Big Key Shop, it was always known as Key Joe’s to the locals. Gordon thinks that it might have been the name of the previous owner of the shop. Between 1947 and 1954 the family lived above the shop until Rowland had enough for the deposit on a house, Gordon told me. 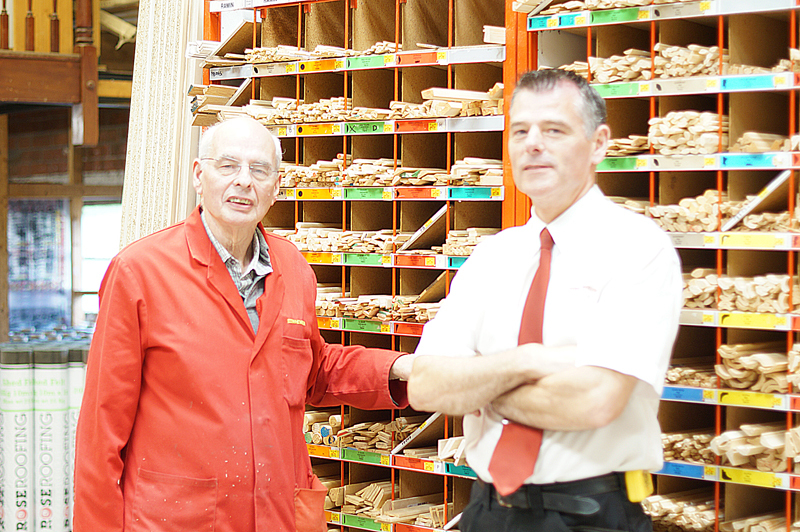 Whewell’s is essentially a family business and Gordon’s son, Michael, runs it along with his father, and now a third generation is part of the company in the shape of Michael’s son. I put it to them that it was great to see such a thriving business in the town in light of so many closures. 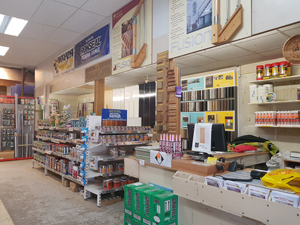 Gordon said that was largely due to the fact that they had a staff that all understood the business and some good customers. “When I started it was already here. All the buildings we have now, except The Toolbox”. 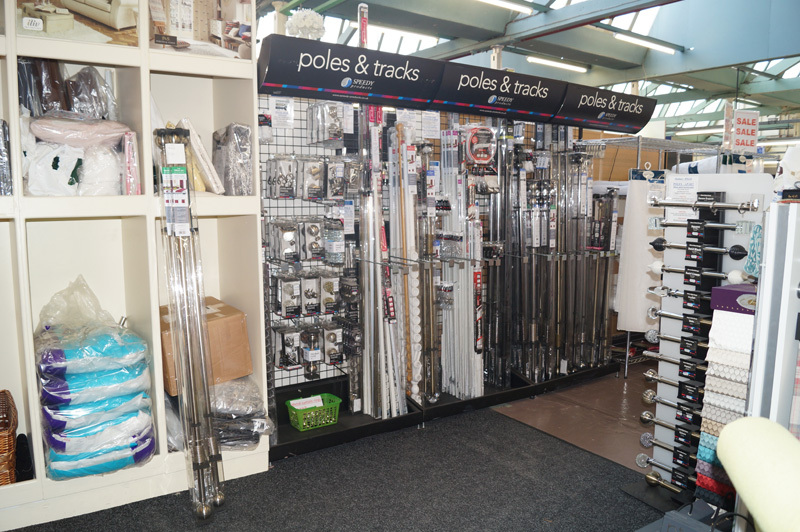 “There were few places to get tools in Accrington so it was an opportunity we took. Michael did say though that one advantage they had over the Internet is the personal touch. Michael also told me that one of the ways to succeed is to recognise what is in trend and cater for it. 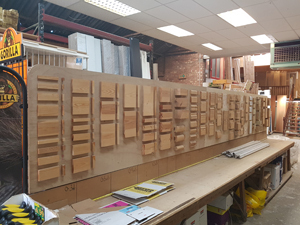 Hardboard was something that everyone wanted to panel their doors with in the 1960s and 70s for instance, but not today and MDF is now one of their top selling products. 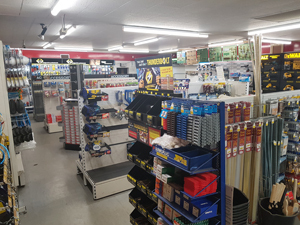 Their customers include DIY enthusiasts and tradesmen alike, and sometimes they will act as a go between to find a tradesman to help the ones who get a little out of their depth. Talking to Gordon and Michael gave me a real insight into why they are still going strong after all these years and on behalf of Acorn News I wish them good luck for the next sixty years and beyond. 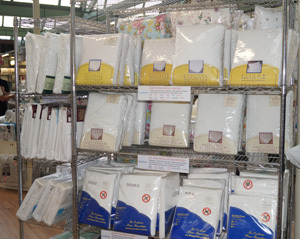 Musbury Fabrics have been housed at Park Mill, Helmshore since the 1990s. 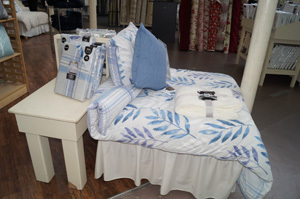 The company, owned by Alistair Mitchell and Kathryn Carr, specialise in bespoke bedding, curtains, cushions, window blinds and many other soft furnishings. Alistair and Kathryn also sub-let a café and a gift shop at the mill premises and have their factory shop next door. The gift shop is called The Furniture & Gift Emporium and the Mill Café at the other end of the substantial downstairs area provides hot meals, sandwiches and an array of beverages. 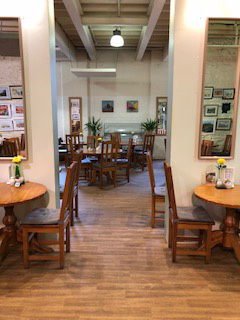 The owner of the Mill Café, Andrew Clarke-Cope has a workforce of six and the café is open daily from 10 a.m. to 4 p.m.
Apart from Helmshore, Musbury Fabrics have two other stores in the area at Oswaldtwistle Mills and Pendle Village. 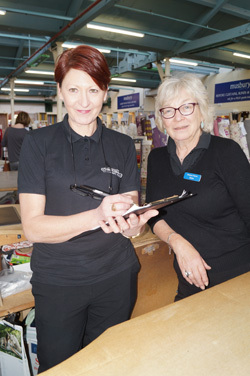 They are currently trialling a new initiative whereby each of their stores has a sleep specialist who will help people select the best bedding, duvets etc. to assist with a good night’s sleep. 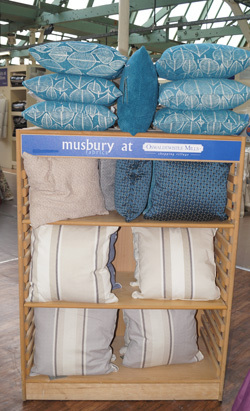 Whilst Musbury no longer weave their own fabric, they buy the best available and make it into the wonderful array of soft furnishings that you will see in any of their outlets. They advertise quality goods at Mill prices and who can argue with that. Over the years my wife and I have bought their products and have never been dissatisfied. 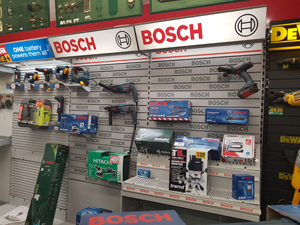 At Oswaldtwistle Mills, which is nearest to where I live, the staff are always ready to help you in a friendly and courteous manner and after speaking to Alistair I can see why. 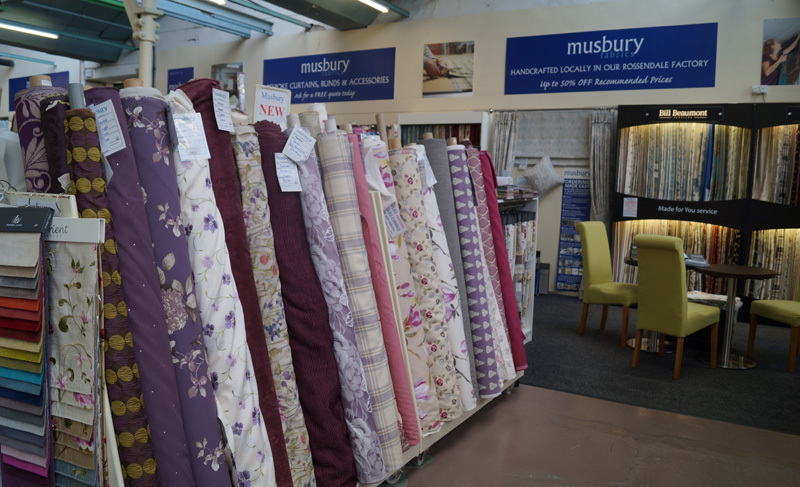 He is obviously proud of the business and even speaking to him you can feel his enthusiasm to maintain the quality that Musbury have achieved for the last twenty odd years. 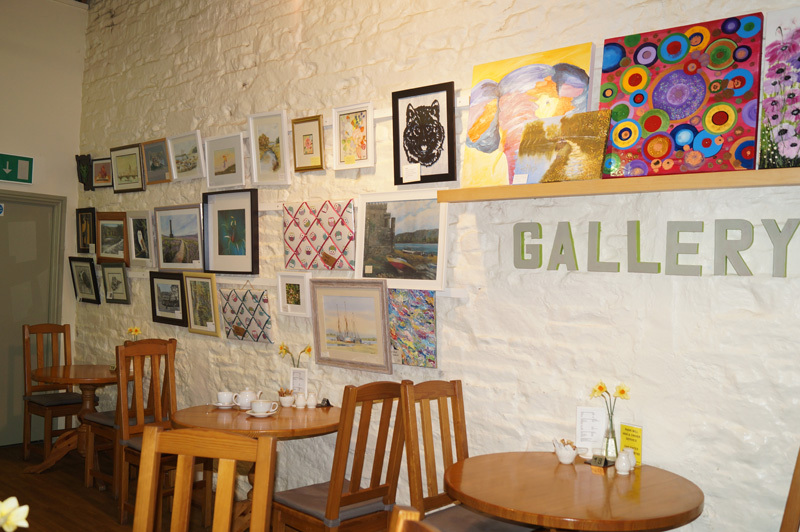 Many café’s throughout the region display pictures by local artists. 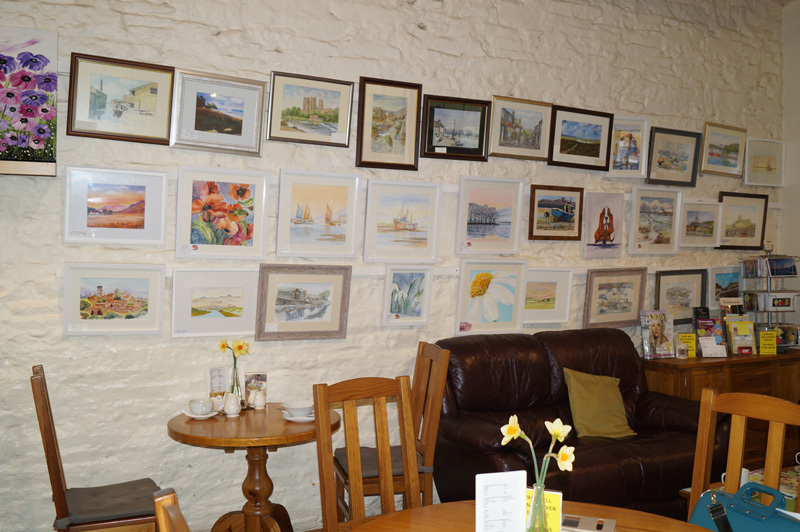 The gallery at The Mill Café in Park Mill, Helmshore is a little different, however, in that 10% from the sale of each painting, goes to Rossendale Hospice. The Mill café is open seven days a week from 10 a.m. to 4 p.m. and Andrew has a staff of six. 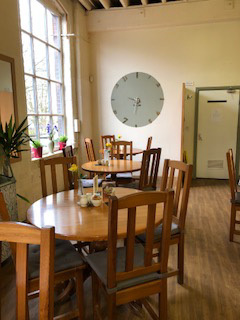 They provide a varied menu including hot food, sandwiches and a selection of beverages and the café occupies half of the spacious area that has a gift shop at the other end. The whole area had a welcoming ambience and the artwork certainly enhances this. Andrew told me that the café has a regular client base and I am sure it attracts new customers by word of mouth. It’s certainly worth a visit. Park Mill Furniture and Flooring have just celebrated their second anniversary at Park Mill, Helmshore. The company, owned by Shaun Evans has actually risen Phoenix-like from the ashes of the former site of their business, Lambert’s Mill, which, whilst not destroyed by fire, was devastated by heavy floods that caused damage and destruction to stock which included sofas, beds and carpets. This unfortunately caused the business to close. That was in December 2015 but by April 2nd the following year, Shaun and business partner, John Booth launched a new business at Park Mill where they occupy the complete second floor. 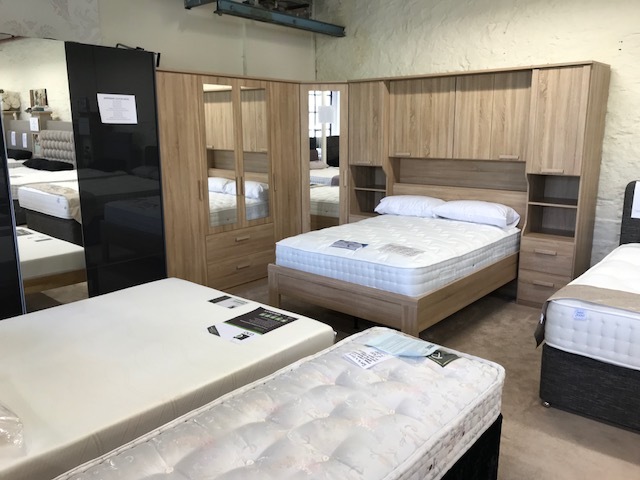 The business is now going from strength to strength and Park Mill Furniture and Flooring provides a wide range of furniture including beds, mattresses, sofas and chests of drawers for every pocket. This is all backed up by employing experienced fitters who have been with the firm for a number of years. The company has recently expanded its product range to include living and dining room furniture and also makes its own range of sofas and a large range of upholstery items are also manufactured in the company’s on-site workshops. These workshops also now offer a re-upholstery service and the team can recover anything from a saggy chair to a complete suite. This is a triumph for dogged determination and a never-say-die attitude.